The case for content localization is always easier to make when translation costs are kept low. So for Sasha, VP of Marketing at a software company eager to translate 150,000 words worth of mobile app and web content into three languages, which scenario do you think she’d feel better about pitching to the board? 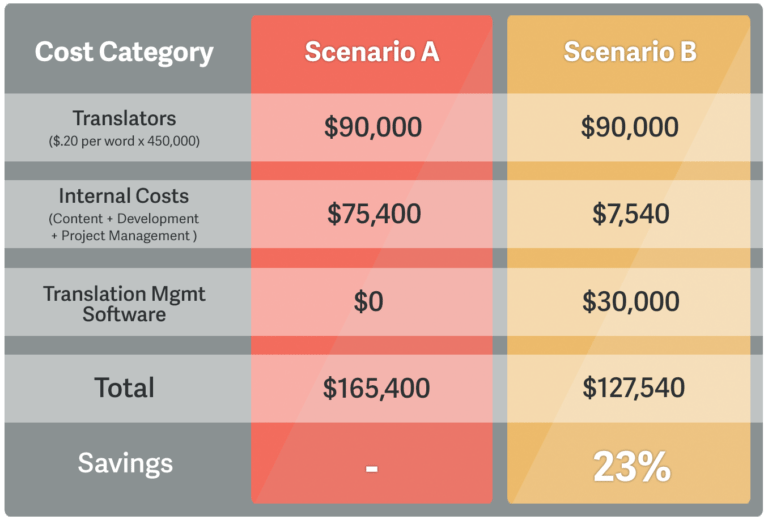 Scenario A may seem like the obvious choice, but the comparison becomes much more intriguing once you begin to account for the internal costs that translation management software is designed to eliminate. The People Cost of Translation Linguistic translators are just one of several categories of collaborators required to publish and maintain multilingual content. In-house employees often play pivotal localization roles as well, and their contributions have a quantifiable cost of their own. Before any translation can begin, content creators and managers must first identify and locate all of the text they’d like to be translated. This sounds like a fairly simple task, but it’s grown increasingly complex in recent years. With publishing duties shared across more departments — and spread across more content management systems, it’s difficult for any one employee to know exactly when and where source text was last updated. Let’s conservatively estimate, then, that it takes the content administrators in Sasha’s company five hours each week to confirm what has been and should be translated within their 150,000-word corporate library. And since these tasks take them away from their core responsibilities of adding and optimizing content, let’s agree their time isn’t free. Now that the desired source text has been identified, there is still the matter of actually getting it into the hands of translators. Depending on where the content resides, it could take several months for developers to manually extract text strings from the supporting software code and paste them into a shareable spreadsheet. Then, on the return journey, testing and deploying completed translations can be just as tedious. Let’s conservatively estimate, then, that it would take Sasha’s developers 10 hours each week to support the translation activities associated with a 150,000-word library expanding into three new languages. And since these tasks distract them from key product development and innovation duties, it only seems fair for their time to carry a cost as well. Last but not least, resourceful project managers are the glue that holds together any effective localization strategy. Success is largely dependent on reducing the time-to-market for localized content, and that can only happen when the complementary efforts of linguistic translators, content administrators, and software developers are seamlessly coordinated. That could mean annotating spreadsheets with context notes, negotiating rush jobs with a translation agency, or simply sending well-timed reminders to developers. All the little things that keep translation projects on track can easily add up to 15 hours of work each week. And considering project managers are often asked to oversee several separate initiatives within the organization, their time gets expensive as well. So in light of this “new” translation cost category, suddenly Scenario A looks a bit different. Cutting Costs and Creating Opportunities The internal costs category applies to both Scenario A and Scenario B, but the $75,400 expense does not. By automating the majority of manual tasks undertaken by Sasha’s teammates, the translation management software embedded in Scenario B can effectively reduce internal costs by 90%. So what began as an apparent $30,000 surcharge has ultimately become a $37,860 savings — and that surplus affords Sasha several attractive opportunities. She could expand the scope of her addressable audience, translating content into four languages for roughly the same subtotal Scenario A would require to translate into three. She could expand the scope of the content she serves her international audience, translating email campaigns and support content that engages customers past the purchase. Or, she could expand the scope of her international marketing strategy to include event sponsorships, media buys, and local partnerships as well. In addition to these notable cost savings, the time savings Scenario B provides for Sasha’s colleagues can also be converted into significant business value. Content teams can create more audience-building assets, developers can delight users with fresh features, and project managers can commit to more aggressive deadlines. However Sasha and her colleagues ultimately allocate their increased budget and bandwidth, though, you can be sure it’s a conversation the board would love to have.